Huntress Sports provided design, engineering, permitting and construction administration services for the $1.2m renovation of Ryan Field at Bowdoin College. 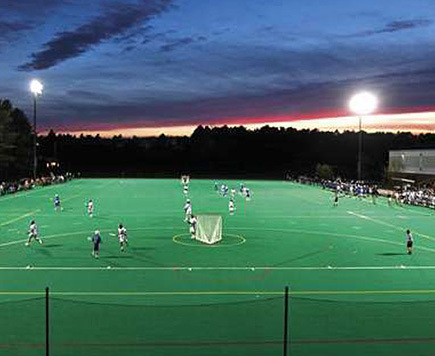 Ryan Field is home to the three time Div III National Champion Bowdoin Field Hockey Program. The renovation include replacing the worn synthetic turf surface with a new Astroturf 12 Knit nylon field, complete with a new elastic layer shockpad, field striping, safety netting and associated drainage and site improvements. The design team worked with the facilities and coaching staff to review all available state-of-the-art synthetic turf surfacing options, evaluate those options against the available budget and make a final recommendation for the selected surface. Throughout construction Huntress Associates completed drainage, compaction, and gmax testing of the renovated field.